BRISTOL - The Plainville girls soccer team couldn’t stop scoring on Tuesday afternoon. Krystyna Miller had five goals, Delaney Beausoleil had two and Courtney Ouellette had one for the Blue Devils in their 8-3 win over Bristol Eastern on Tuesday afternoon at Plainville. The offensive performance of the three sophomores, the play of senior goalkeeper Caitlin Barker and the experienced defense in front of her has the Blue Devils thinking this is their year. The Lancers started sophomore Riley Giblin in net, her first varsity start. Giblin played better than the stats would show, as Bristol Eastern’s defense couldn’t solve the Blue Devils’ offensive ability. It led to a 4-0 score at the end of the first half on one goal from Miller, two from Beausoleil and the fourth from Ouellette. Coming out of the half, the Lancers were looking for a spark. At the 36-minute mark it looked like Bristol Eastern was going to get on the board when Myah Croze put a shot on net that Barker leaped in the air to get a hand on for the save. 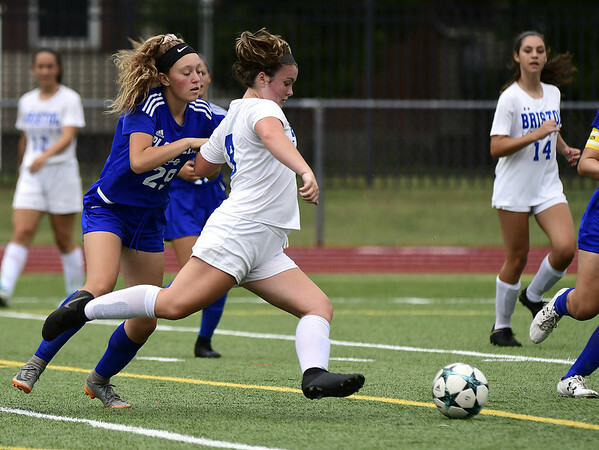 Just after that opportunity, Miller added the first goal of the second half for Plainville, which ignited her dominant final 40 minutes of play, in which she scored four of the five goals. Her second goal of the game may have been the most impressive one, as she found an opening on the left side of the field and placed the ball perfectly over the head of Giblin, giving the goalkeeper no chance to get the ball that dropped in the right corner of the net. With a 5-0 deficit and defensive struggles plaguing the Lancers, they didn’t give up. Senior captain Kailey Laprise broke free, showing off her speed to score Bristol Eastern’s first goal of the game at the 22 minute mark in the second half. Lancers freshman Ciara Collins brought Bristol Eastern within three with her first varsity goal. The momentum seemed to slowly be shifting in the Lancers’ favor, especially after Croze pulled Bristol Eastern within two with her first goal of the season to bring her within two of tying the Lancers’ school record of 42 goals set by Christi Carone. With just over 10 minutes remaining, Miller erased the Bristol Eastern momentum quickly, scoring less than one minute after Croze and then proceeding to score twice in the final minute of play. The Blue Devils moved to 2-0 on the season with the win. Bristol Eastern fell to 0-1 to start the season. Posted in The Bristol Press, Bristol Eastern on Tuesday, 11 September 2018 21:31. Updated: Tuesday, 11 September 2018 21:33.